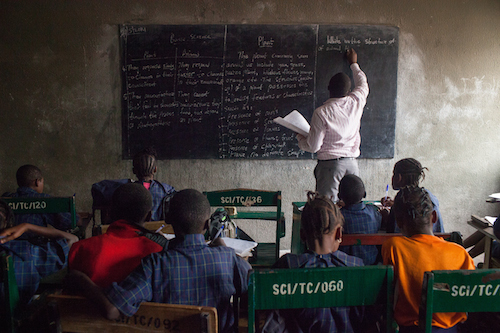 Mr. Obongho Linus Ikpi, the Head teacher of Obanjom Memorial Primary School, Ugep, Yakurr Local Government Area of Cross River State, has been demoted to a classroom teacher. His demotion was ordered by the Cross River State Universal Basic Education Board (CR-SUBEB) for payslip forgery. Daily Post reports that the payslip was purportedly forged to enable the suspect access computer allocation from the Head of Service. “SUBEB checked records and discovered that the alleged deduction in the payslip was not recorded there. Upon further interrogation, Ikpi confessed to having forged the payslip,” a source said. Odey said the demotion of the suspect was to serve as deterrent to others. “To serve as a deterrent, we have decided to demote and suspend him while investigations continue. We have directed that the Executive Secretary should inform the deputy to take over as head teacher with immediate effect”, Odey said. Warning Teachers to desist from all forms of criminality, Odey said the eagle eye of the Board was upon them. “We are setting an eagle eye on teachers because from what he told us, we believe strongly that others have either attempted to do this or are doing this”, he said. In his confessional Statement, Ikpi said, “I doctored pay advice for the month of January 2018 with an amount of three thousand six hundred and ninety-five naira for collection of computer equipment from Head of Service. The act was discovered by SUBEB payroll staff”. He however appealed to the Board for forgiveness. “I am pleading that I should be forgiven for such obnoxious behaviour. It will never happen again,” he appealed.